How was your weekend? We had family visit which was fun and kept us busy. We also tried out a new restaurant, Frank’s Pizzeria, which has now taken the best pizza I have had in Omaha title. If you’re looking for great places to eat in Omaha check out my Omaha Eats page. I try to keep it updated as I eat at new places but if you have suggestions to add please let me know! P.S. If you’re thinking of moving to Omaha (you totally should and if you do let me know and we can be BFFs) here is a list of 30 cool Omaha things. Fish is a food that I just don’t eat enough of. To be completely honest with you the only time I actually think about eating fish/seafood is when I get a mad sushi craving or during Lent. Growing up I used to eat fish at least a couple times a week. It totally felt like every other day though, mom. My dad would frequently go fishing on the weekend and bring home lots of fresh bluegill, crappie, perch, and walleye. There was always fresh fish in the fridge or in ziplock baggies in the freezer. As a child I didn’t realize how lucky I was to be able to eat some much fresh fish. Given that it we are currently in the Lenten season, I see advertisements all over for all the Fish Fry’s that all the different Catholic churches in town host. The problem is rumors are that the wait is always so crazy long. Which is not ideal when you have three young children. I decided to skip the long line and make my own fish sticks and sandwiches at home. CodÂ is the fish of choice I used here. I like cod because it doesn’t have an overwhelming fishy flavor and because it is a denser piece of meat.Â WhitefishÂ is ideal for breading and frying because it doesn’t fall apart. You want to choose a fish that will hold together. Haddock or pollock would be great too. Trader Joe’s had cod fillets in their freezer section and that was pretty much the inspiration for this dinner. I cut two of the fillets into 1 inch thick strips to make fish sticks for the kiddos. The other fillet I cut in half so Alex and I could enjoy a grown up fish sandwich. To bread these bad boys it is an easy three step process first a dip in the flour, then egg, and then breadcrumbs. A combination of Panko, which is a Japanese style breadcrumb, and regular breadcrumbs are what I used. I didn’t have enough of either type so I mixed them together. 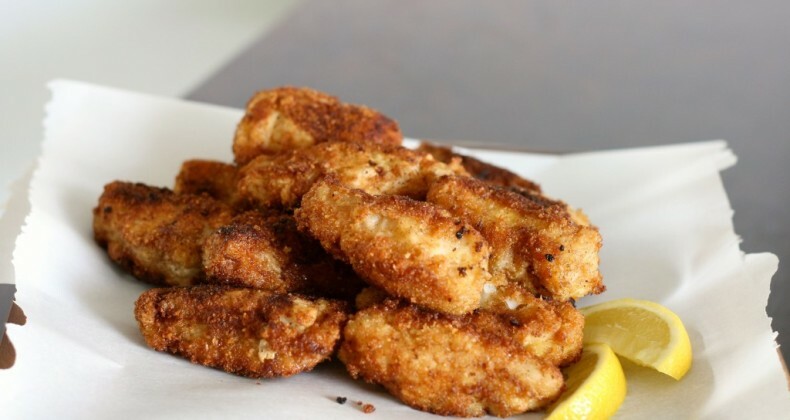 If you are looking for a really crisp breading go all Panko. When my mom made fish she always put a little peanut butter in with the oil. It helped keep the fishy oily smell under control. I’m sure you could use peanut oil and have similar results. Are you a big fish eater? What is your favorite fish? Serve with a squeeze of lemon juice. 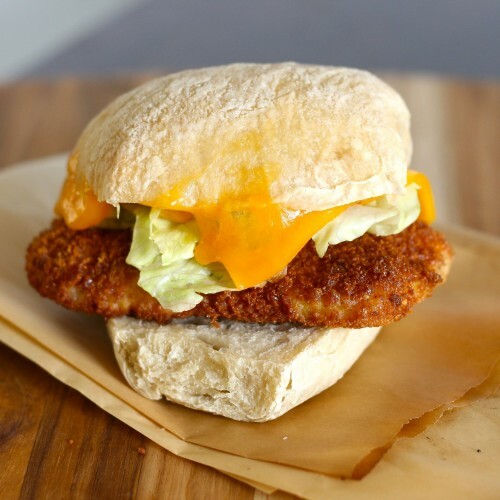 Eat as fish sticks or place on bun with lettuce, cheese, and your favorite tartar sauce. Using paper towels dry off fish. In three shallow dishes place flour in one, beaten egg in another, and breadcrumbs in the final dish. Heat oil in large skillet over medium-medium high heat. You want the temperature to reach about 360 degrees F.
Dredge fish in flour, shaking off excess, coat with egg, then dip in breadcrumbs pressing down so they will stick. 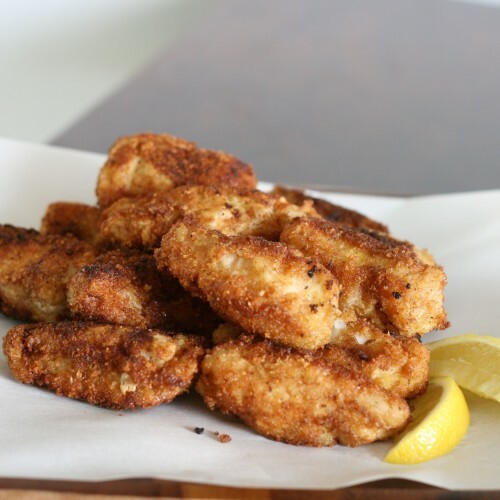 Place breaded fish, in batches, in skillet cooking until breadcrumbs become golden brown. Turn after about 3 minutes. Place on paper towel to absorb extra grease. Season with salt. These fish sticks and sandwiches are absolutely amazing! My fave thing is fish sticks so I must try these! I like fish but unfortunately Matthew doesn’t so with meals at home it’s not common for me to make fish (cause he won’t eat it!). I’m craving these sticks now! Fantastic! I love fish sandwiches and I now have a sudden craving for one. Love fish! My kids do too but my husband has learned to like it the past few years. My favorite fish is halibut! Can’t get enough of it. Since starting a diet I ordered 20 lbs of the greatness from Alaska. Eat it several times a week!! !